We took a 18:15 flight from Heathrow to Singapore with Singapore Airlines on the 26th of November 2005 which landed after lunch on the 27th. 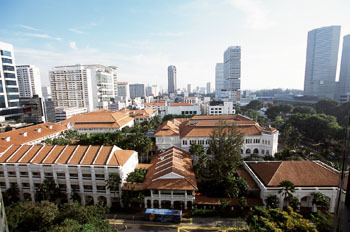 We travelled to The Raffles, not realising that The Raffles City Plaza (where we were actually staying) was across the road. We finally managed to check in around 16:00. From our hotel room we were able to see The Raffles. We changed and then headed into town for a bit of shopping on Orchard Road. 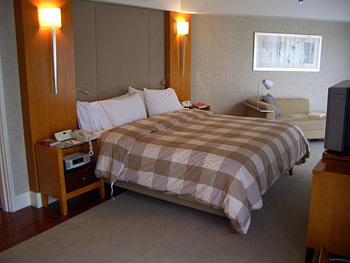 A picture of our room at The Raffles City Plaza. Some interesting modern art outside our hotel. 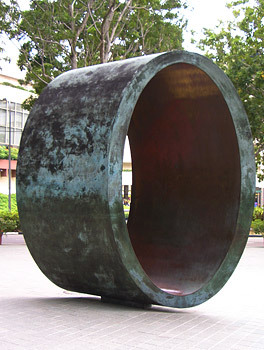 An elongated piece of pipe provided an interesting perspective. 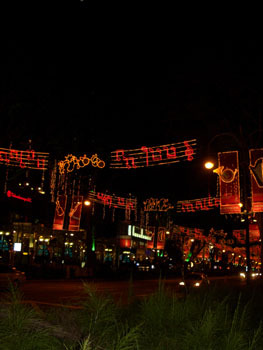 Christmas Lights on Orchard Road. 28th November. As a result of the jetlag we woke the next morning at 04:00 and had to wait for three and a half hours before we could have breakfast – a buffet by the pool (on the 8th floor!) at the hotel's Alligator Pear restaurant. Breakfast was great and I ended up eating loads! We decided to go on a few bus tours around the city. 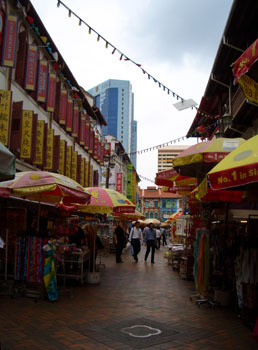 We took the heratage and city tours then got back on the heratage tour which took us to China Town where we stopped for lunch and a bit of shopping. 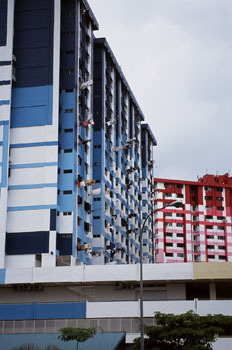 A large proportion of Singaporians (87%) live in Government Housing which typically looks like these brightly coloured high rise blocks. Drying washing is hung on poles from each balcony. 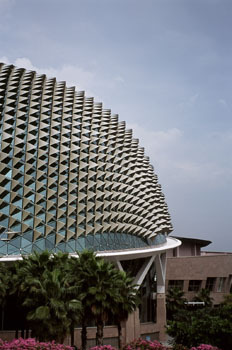 Singapore's opera house has been designed to look like a microphone. Ten thousand aluminium panels cover the building to reflect sunlight, wherever the sun might be, thus reducing the amount of air conditioning that is required. We travelled back to The Raffles City Plaza, wandered around the mall and went back to our room for a rest before our night tour. 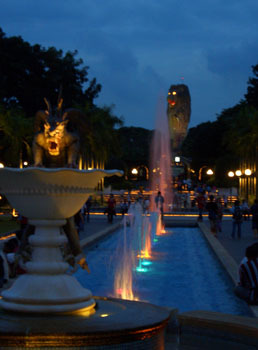 On our second evening in Singapore we visited Sentosa, as part of our night tour. A rather strange theme park with a water display as the main showcase. 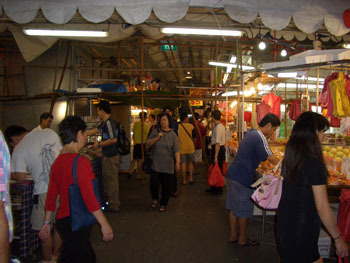 Our tour then took us to a night market in China Town before taking us back to the hotel. 29th November. We woke early and once again I had a huge breakfast. We sat by the pool for about an hour before checking out. 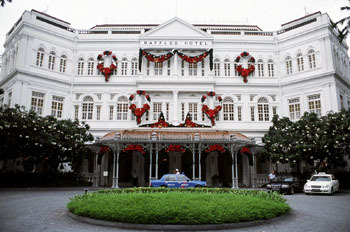 We walked around the shops in the hotel's mall (the main thing one can do in Singapore) and visited the Raffles Hotel. We then travelled into town and ended up spending ages trying to get the best price for a 200mm Nikon lens. We got a taxi and dashed back to our hotel to pick up our bags and headed for the airport. We took the 00:00 flight from Singapore to Auckland where we spent the rest of our two weeks away.